Home » AutoCAD » What Are The Best Tools For Factory Design & Management? djovica February 9, 2014 February 9, 2014 No Comments on What Are The Best Tools For Factory Design & Management? A Way To Address Factory Layouts, Engineering, Sales, Lean Manufacturing, Made to Order, Scheduling & Production Planning Challenges. The design and management of a factory involves many tools and stakeholders. Engineers can design the facilities layout with architectural structures, conveyors, materials handling, process equipment, safety equipment, office furniture, storage, building utilities (MEP), robots, spray booths, pits, platforms freezers, forklifts and humans, just to name a few categories. What if you are a supplier of one of these items and need to work with your client, giving them the best CAD & Analytical data is crucial to winning or maintaining business. What CAD package can do all of that? The answer is none can. AutoCAD which is a horizontal tool, that can cater for any industry, but lacks the technology that comes with 3D Solid Parametric & Direct Editing Modelers. 3D Solid Modelers are Industry based and if it’s a Structural/Architectural 3D CAD package, it lacks the Mechanical aspect and vice/versa. On top of that when you need to ‘layout’ the facility, 3D Solid Modelling isn’t conducive to that work flow, because we start with a 3D model and detail it in 2D not the other way around and who’s going to create or source a 3D library of all those hundreds if not thousands of items. So it gets all too hard and the engineer usually creates the facility in 2D that symbolises the layout. Once put together, will it work? what’s the best way to layout the facility? Most times experience and learning from past mistakes are the best tools for the job. When you need to analyse processes, utilisation and consumption, then another application is required, usually Microsoft Excel. It is usually the tool of choice for scheduling, planning and analysis.Even then, you don’t always get it right, so even after the layout becomes a reality it needs to be re-analysed and optimised for better production. How about creating a new line that is made to order or applying the latest in Lean Manufacturing principles. What if you need engineering CAD data for analysis, or Excel data for engineering? How do these two systems work with ERP/MRP? Before you can build or upgrade the factory, you need to ‘sell’ the idea to the board, your client, management, etc., to get the funding. How do you demonstrate it? Whip out the AutoCAD drawing and explain ‘how’ it will operate and look like, show some representational flat images, open Excel and explain the graphs or put it all together in a PowerPoint Presentation. Visuals and technical explanations are open to interpretation depending on who is listening and their level of expertise. 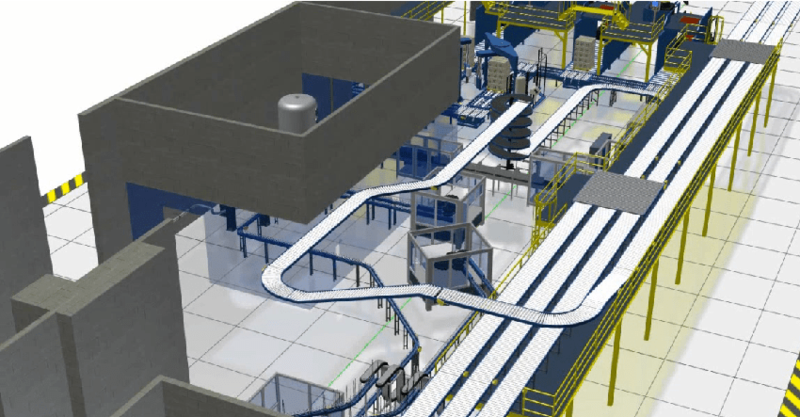 Autodesk Factory Design is a suite of tools that can address these challenges and much more, taking Factory Design & Management into the 21st century. It’s a Hybrid 2D Layout-3D Modelling Environment with tools for Process Analysis, Machine Utilisation and Energy Consumption. It has the intelligence to work with external applications like Excel and external databases (i.e. ERP). With a subject as detailed as this, unfortunately, I need to spread it out, so please stay tuned for the next post.